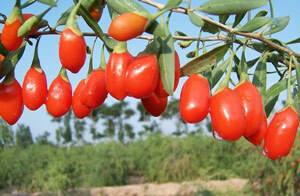 The goji berry originates in Asia and has been cultivated by Chinese, Mongolian and Tibetan people for over 5000 years. The small densely branched tree thrives in alkaline soils and can be found today growing wild in mountainous areas throughout Asia and Europe. According to ancient Chinese medi-cine, eating goji berries can increase longevity, strength and libido; traditional eastern medicine rec-ommends the berries of the goji tree for the treatment of various ailments as well as generally in-creased vitality, and due to its bright red colour, the goji berry is considered to be a potent tonic for the blood, liver and kidneys. The goji tree is a hardy plant and toler-ates climatic extremes in its native Hima-layan range, from winter lows of - 26°C to summer highs of up to 40°C. Trees begin to produce berries after 2 years of growth, and bloom with small, white trumpet shaped flowers before bearing fruit each autumn. Ancient legend credits a daily diet of goji berries for the longevity of the Chinese herbal master Li Quing Yuen , who it is told lived to be 252, and the goji tree itself can live for many hundreds of years. Goji berries are also known as ‘wolf berries’ and the name goji is thought to originate from the Chi-nese character ‘gou’ meaning dog, or wolf. 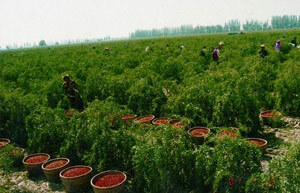 The main goji growing area in Asia today is Ningxia prov-ince, where over 180,000 acres of land are devoted to the cultivation of goji trees for their fruit. In rural parts of China, stands of goji plants can still be found growing wild where local villagers have returned to pick their fruit for hundreds of generations. 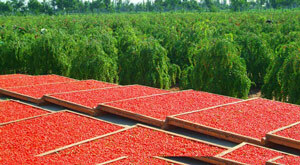 Our goji berries are grown on a plantation on the banks of the Yel-low River in China, where the rich soil provides all of the water and nutrients needed by the growing goji trees. Around 3000 trees are panted per hectare, and the ever-green shrubs are encouraged to grow lengthways (similarly to a vine) and stand around 1 metre high, which makes it easier to har-vest the ripe berries. Each tree can produce around 1kg of berries, which are harvested between June and November of each year. As the ripe berries are fragile and eas-ily damaged they must be carefully picked by hand, avoiding the sharp thorns of the goji tree. Legend holds that if touched when unripe, the goji berry will oxidise and turn black, and the traditional hand picking method is still favoured over mechan-ical harvesting today. 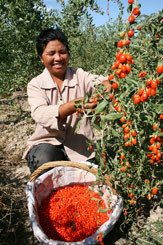 A single berry picker will collect on average 30kg of fresh goji berries in a day. The harvested ber-ries are carefully cleaned and then laid out to dry under the sun. Once fully dry the goji berries re-semble small red raisins, and can be safely stored without the need for preservatives for over a year, retaining their characteristic colour, taste and ar-ray of nutrients. Since its discovery by western cul-tures in the past decade, the goji berry has become a popular compo-nent of nearly every health con-scious diet. Its versatility makes it easy to incorporate into a range of dishes; goji berries can be added to savoury stews imparting a subtly sweet flavour and juicy texture, eat-en on their own as a healthy snack, or mixed into desserts as a vitamin packed alternative to chocolate chips. A 100g serving of dried goji berries contains on average 43.4mg of vitamin C, a powerful natural anti-oxidant which can reduce cellular damage by harmful free radicals and may help boost immunity. There are also 184mg of the antioxidant vitamin E, and 70mg of the photosynthetic pigment carotene both associated with maintaining healthy youthful looking skin. Gojis are also high in polysaccharides, long chains of sugar molecules which studies suggest may play a vital role in cell communication. Our dried goji berries make a satisfying snack on their own, or try blending into a breakfast smoothie for a powerful antioxidant boost to start your day.